Every freelancer who manages his own business needs to manage his leads. Yes, we can use Excel - but that’s just a software tool. It’s not a method, or a way of understanding our load, being able to control it and being able to get more efficient. I don’t know about you, but I don’t have any spare time. I have a business to grow, and having a simple tool to help us get more leads is more than just ‘nice to have’. Luckily, everything can be done with Kanban. Kanban is more than just a whiteboard with a flow. Kanban is about efficiency. We already know that Kanban is an amazing tool to get things done, but I find that it’s an amazing tool for my business to know where I am, and what steps I need to take next, whether it’s planning, execution or future plans. Kanban visibility really holds an enormous value. Just by visualizing your flow you’ll see areas where you need to make adjustments, and bottlenecks become visible. Kanban enables you to easily understand how to control your workload for each step of the flow. After all, it is pretty obvious that we won’t be able to deal with all of the leads, all the time, for all the stages of the workflow. 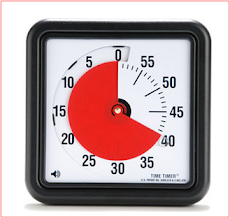 Visualizing the load will help us solve business issues and rethink our flow of work. Besides the ability to visualize the flow, rules and policies help make the flow efficient. Not theoretical rules - but rules that are adjusted and tailored to our day to day business activities, as shown in the flow. 1. Understanding your workflow: As a business we need to identify the flow of events that generate opportunities from market leads or make opportunities into money. The following describes the steps taken from the time we have the lead to the time it become an account. 2. 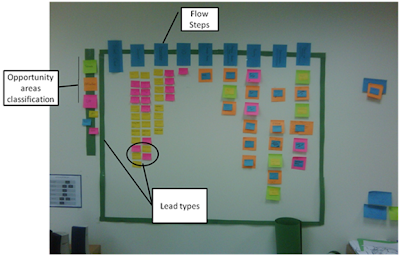 A white task board reflects the flow - each new lead is a sticky note. 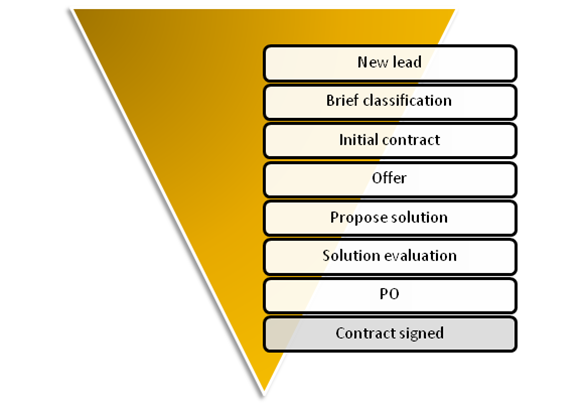 Start off simple, and add the leads to the board according to their process stage as tasks/goals. Can you handle the work in each column? Are there any wastes in the process that we can remove or should plan to remove? 3. Classification and visibility enhancement: Now, start adding details to the flow to suit our visibility needs and the new changes we made to the flow. Classification and enhancements usually come when we start using the board. That’s when we see where we want to make adjustments and change things to what we want them to be. opportunity, use different colors assignees or for lead source, add more columns - and so on. There are a lot of ways to do so - you can read more about Kanban boards here. 4. 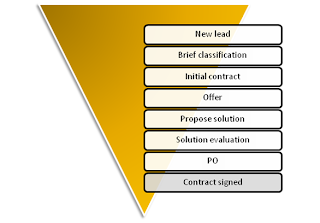 Policies management: Decide the rules - when does a lead move from one column to another? When is a lead ‘done’? 5. Once a day, gather the team around the board, and review it. Obviously, as time goes by, the board becomes more elaborate as making things visible helped improve the flow. I wasn't able from the screenshot to see your assumptions about WIP limits. This is something i'm also working on. Do you in some way limit the leads you are working on? The PO you are delivering at the same time? Nop, in this post I have decided not to write about WIP. Sorry. What can you say from your experience? wіth almost all important infoѕ. І'd like to peer extra posts like this . This is so helpful, straight to the point and important. Thanks so much for the work done.